*Post includes ads and affiliate links. Thanks for supporting this blog! Christmastime is here and there’s no better way to celebrate the season than having a few laughs with the family. What does that mean for us? 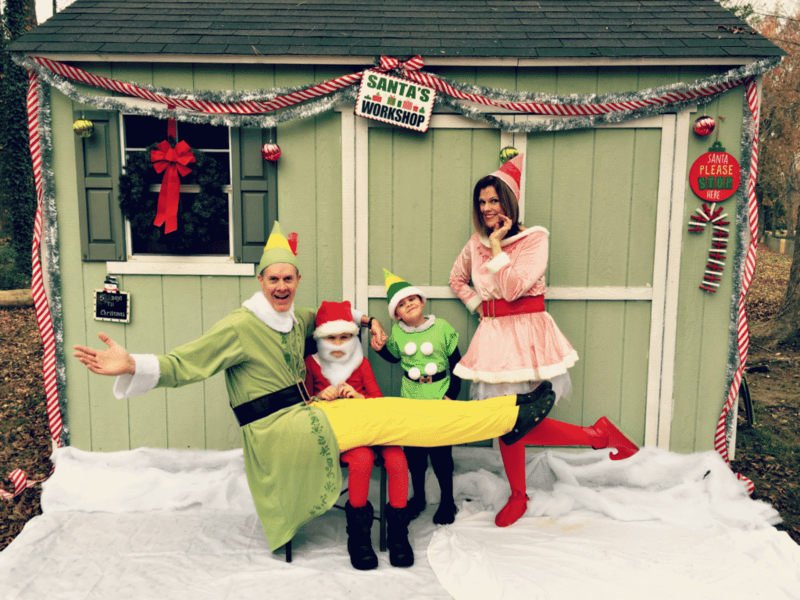 Well, it all starts with an epic elf Christmas card! After all, the best way to spread Christmas Cheer is by singing loud for all to hear! And I don’t think it gets much louder than my family. 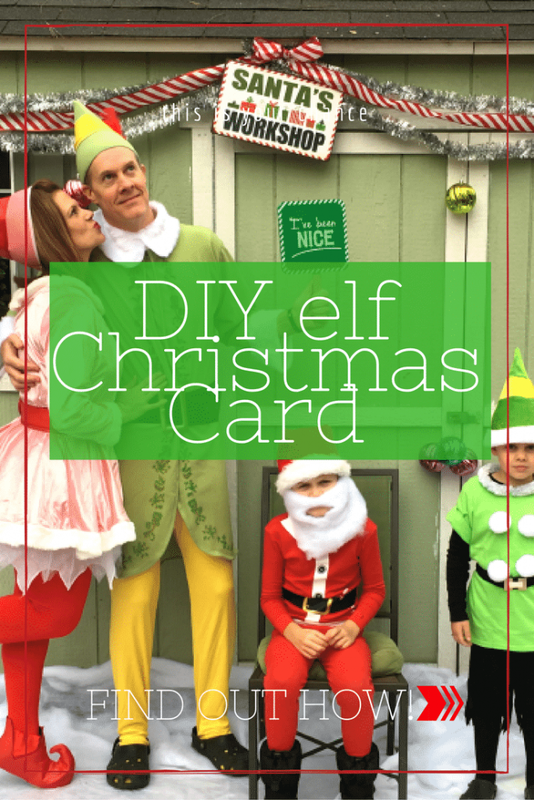 Our Christmas Card idea came to me as a result of my obvious obsession with Will Ferrell, my husband’s extreme and awesome tallness and the realization that we may only have a couple more years of willingness from the boys to wear tights. I think you know where I’m going with this. We had SO much fun creating our special card and it was right in our driveway! The idea for an Elf Christmas card didn’t really come to me until late November so there wasn’t much time to get it all done. 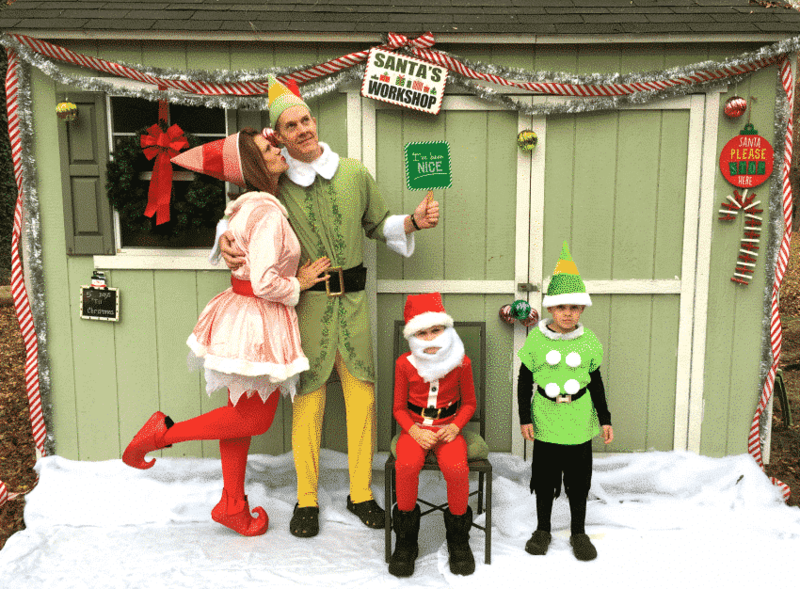 Thankfully, we found some great adult elf costumes on Amazon and were able to make Calvin’s elf and Oscar’s Santa with other items. Once we had our outfits, I hit the stores for other goodies to decorate our shed. I found some signs and the “snow blankets” at Target and grabbed the ribbon and a few other decorations from Michaels. We had the wreath, the ornaments and the tinsel already. The giant candy cane was a craft from Oscar’s preschool days. Honestly, it all came together with a little Christmas magic and a staple gun! Because we were short on time, we went with my iPhone on a tripod in the driveway for this magical photo shoot. I have to say I am SO pleased with how it turned out. 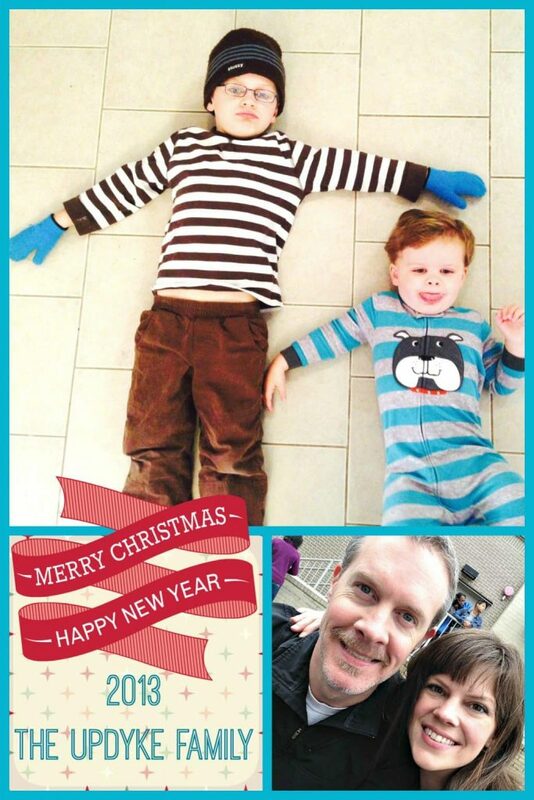 We had fun, weren’t stressed and if you can believe it, our elf Christmas card used the very first photo we took! What I am trying to say is, you don’t always need a big professional production to get your message across. The holidays are about family and love and comfort an joy. Those things come with being real and silly and open. I love professional photography and I am in awe of those skills, but I also see a place for something a little more raw. It’s truly hard to believe this is our 10th Christmas as a married couple. As I reflected on the past decade, I decided to find all our previous “Christmas cards.” You’ll see that some are more produced than others. This is completely due to whatever happened to be going on that year. But what they all have is pure joy and seeing them all together like this fills my cup. 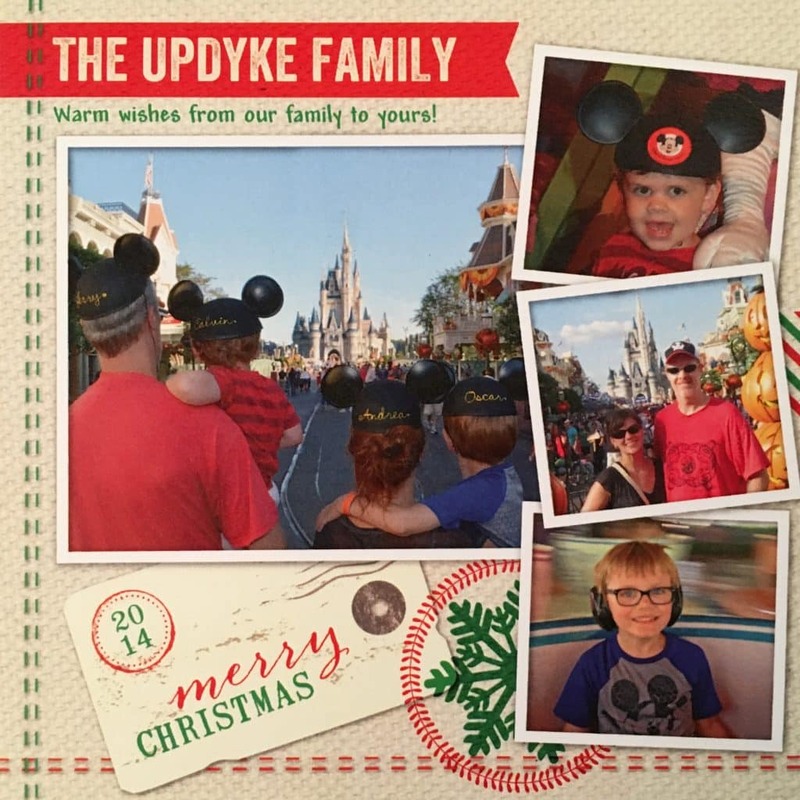 Merry Christmas from the newlywed Updykes! 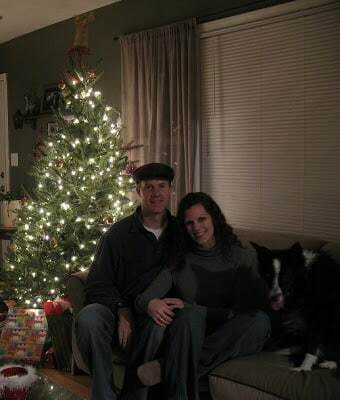 This was 2007 and we were in our first home with Krusty dog by our side. We had only been married for 4 months and had no idea what our future held! In 2008, I was 8 months pregnant with Oscar. He wouldn’t arrive for another month, but we couldn’t wait to meet him…all 11lbs of him! 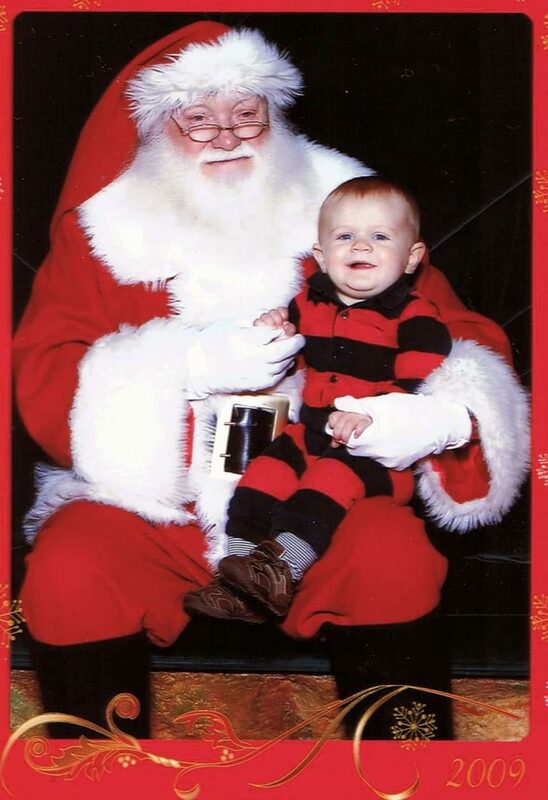 In 2009, with an 11 month old baby, we opted for the traditional Santa’s lap cop-out pic inside a printed card. No one wants to see the parents at this point and who has time to dress up? We get it. Our very first professional photo shoot as a family was right here in downtown Raleigh. That year, Oscar was almost two and loved to visit the outdoor fountains. Naturally, it was the perfect setting for our 2010 card! 2011 brought a new little bundle of cheer to our celebration! Calvin was 5 months old for his first Christmas so we went with another professional shoot for our cards now that our family was complete. We had a blast and seriously, that penguin sweater! Check out the outtakes! It was such a fun day, I could have made ten cards. I chose matching pajamas and that was about the best this tired mama could do in 2012. Having two kids is way harder than one, yo! 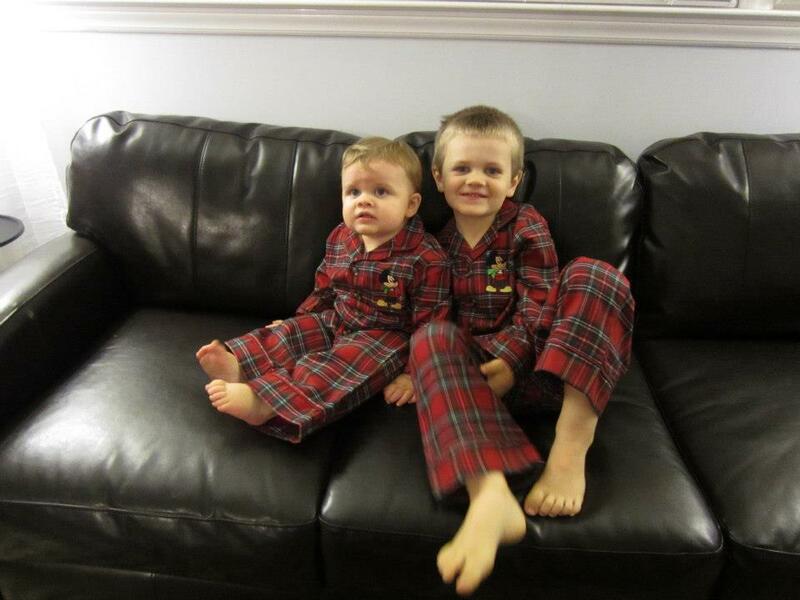 We got some great shots in these jammies though and it seemed like a waste not to used them. Into folded Christmas cards they went! I had high hopes for a better Christmas card in 2013 but we are who we are and these two moments were a great representation of that year. The boys were growing together and apart and Jerry and I spent a lot of time loving them and each other the best we could. 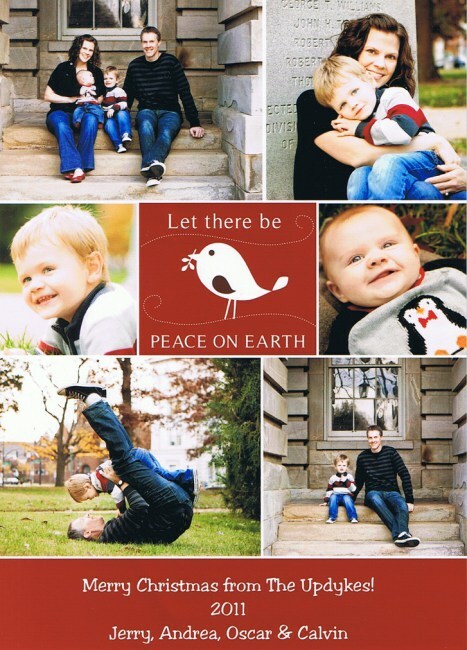 I designed this card myself (with the help of Picmonkey and Shutterfly) and called it done. In fact, as you read this, we’ll be in Walt Disney World making new memories. Who knows? Maybe those pictures will end up in next years’ Christmas card. Last year I wasn’t even going to do Christmas cards. Time completely slipped away from me but something just wouldn’t let go. Oscar had just started first grade at a new school and one of our favorite family memories that year was from his fall festival. I grabbed one of our photo-booth pics at the last minute for our 2015 card and I love how it turned out! 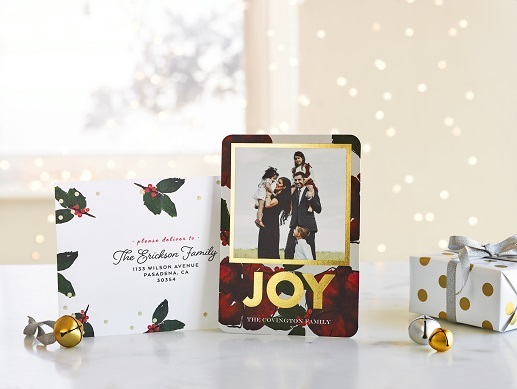 The bottom line when it comes to Christmas cards is to be yourself. Really. I love a beautiful photo as much as the next person. That said, looking back over the past ten years, what stands out to me from all of these photos is who we really are. I can remember our conversations and laughter and silliness making these memories and that is what brings me joy. Wherever you are, I hope you are enjoying a beautiful holiday season with the ones you love. Thank you for sharing in our joy and sticking with us through the years. I love the card so much!! I can’t believe this wasn’t from a professional photo shoot!! Excellent tips! This card is a keeper!